Races in Singapore are very scarce. For the next 3 months, there are only (hear this) one official race and a couple of small, club races. The official race is the Singapore Marathon, which is the biggest running event locally with 40,000 participants. I've registered for one of the side dish event, namely the 10K. Counting down from today, I only have four weeks to prepare for the race. I downloaded the HR data from last week's marathon: HR was hovering between 160-165 for the first half, then 165-170 for the second half. My Max HR is probably about 193-195 bpm (no test in the last 2 years). Using 165 as an average, this implies roughly 85% Max HR. It seems that I didn't race according to my physiological capacity and could actually give a bit more. Anyway, after a barren spell of 2 years without PB, last week's race really boosted my morale. I felt that I could run a much faster marathon. My wife plans to give birth in Melbourne and she plans to stay there from January. Since I will continue to work here, then virtually I have more time to train. The problem is that I might not have a lot of chance to do a marathon. There is Hong Kong Marathon in February and timewise it fits fairly well because it allows 3 months for training and still a good 6 weeks before the baby is born. However, the course is slightly hilly, especially in the last 7k coming out of the sub-sea tunnel then facing 3 steep ramps in a row. I'd say the chance for a PB is probably small. 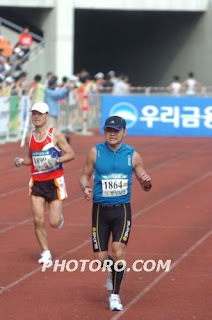 Then there is Dong A Seoul Marathon (flat course) in mid March, however this is only a couple of weeks before the baby, so my wife might get very sensitive about it and she probably needs a lot of support. Finally, there is Canberra Marathon which is two weeks after the baby is born. Again, I don't know whether this will be a sensitive issue and I might get some sleepless nights too. Although, I love running very much, but family is definitely the number one priority. Training is pretty much in recovery mode this week. I tried to avoid runing as much as possible for 5 days to provide a mental break. Started running again during the weekend and did a tempo run today. Finishing inside the Olympic stadium must have been a thrill. Of course family comes first, but it would be good if you could do Canberra - it's a PB course when the weather's normal (most years). I think you'll run a good 10k off the marathon prep. Re the HR average - I don't think running at much more than 90% is possible for a marathon. The fast runners run at a lower % of max - it's not the cardio system that limits them, rather it's muscular 'endurance' and speed. Think a 10k pb could be on the cards, a lot of people set pb's in these type of distances not long after Marathon. 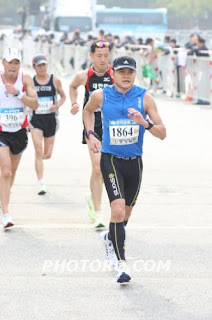 it is not a PB course, but do not forget the China Coast Marathon, on January 18th in HK. 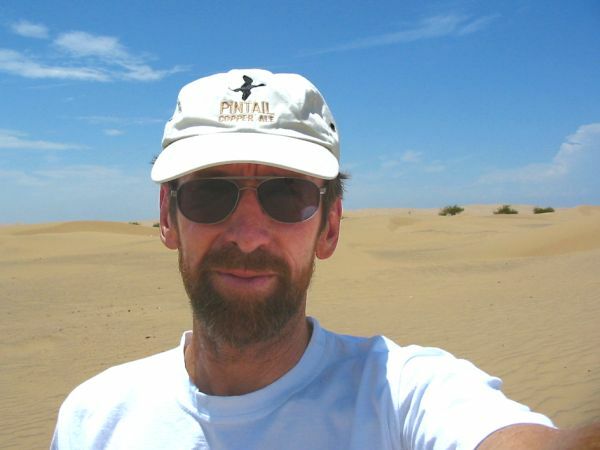 Very scenic tough course, prizes for 5yrs age groups (you do not get back home empty handed). For HK marathon, it is a bit hilly (yes, the tunnel...) and a total gamble on the weather. 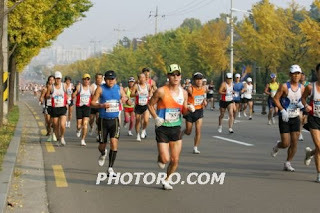 for a PB, then you can think about Xiamen Marathon (China). It is flat flat, huge crowd support and well organized. Nice course along the sea. The weather should be ideal then. January 3rd 2009.